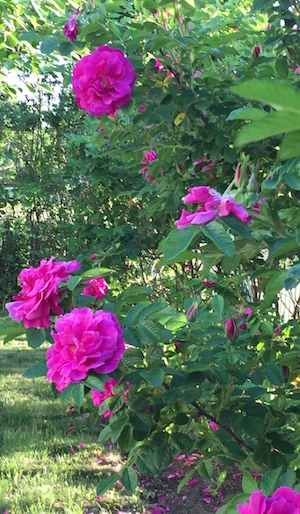 Rugosa roses, such as ‘Hansa,’ perform well on Long Island and can withstand harsh conditions. Many gardeners love roses but are terrified to grow them, citing the plants’ long-held and mostly undeserved reputation for being fussy and difficult to maintain. These folks are resigned to enjoy roses from afar, gaze enviously at the well-tended beds of their impossibly green-thumbed neighbors or look longingly at the stunning displays at their local botanical garden. Now for the good news: Rose cultivation is not the thorny problem it used to be. That’s great news for anyone wanting to try their hand growing what is inarguably one of the most beautiful blooms on Earth (and also the official flower of the state of New York and the United States). I compare the varieties I grow now with one from my childhood. My family owned a small house in the Bronx on a tiny plot that had a single shrub rose in front of a rusting chain-link fence. For most of the growing season the shrub was unremarkable, but by mid-June it would erupt into a stunning display of clove-scented, velvety scarlet blooms that transformed that eyesore fence into a living work of art for a few glorious weeks. To my mother, the Annual Blooming of the Red Rose held the same significance as the celebration of a major holiday. She filled vases with freshly cut flowers and taped sprigs to wrapped birthday presents in lieu of a bow or ribbon. In some instances, the recipient preferred the rose adornment to the actual gift! 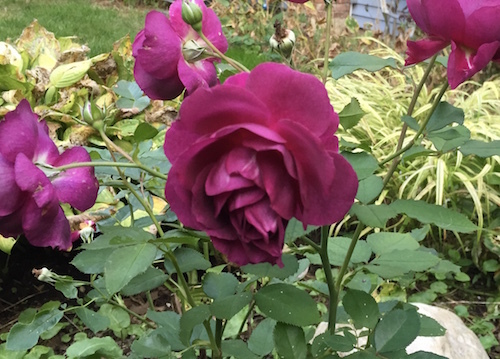 I never found out the name of the rose my mother grew, but judging by its once-blooming habit it probably was an antique or old garden variety hybridized or discovered before 1867. Considering the wide range of hardy, ever-blooming choices available today, rose cultivation has become more accessible for the average gardener, albeit it is not a completely carefree endeavor. An easy-to-grow variety is the Knock Out® shrub rose — a dependable, disease-resistant prolific bloomer. These sterling attributes make it go-to favorite of landscape professionals everywhere, which means it tends to be overplanted (it is the ubiquitous choice for funeral homes, fast food joints and strip malls). My main beef with Knock Out® is that it is not fragrant. Floribunda ‘Ebb Tide’ is a prolific bloomer that makes a stunning centerpiece in the garden. If you can’t imagine growing roses without fragrance, consider the rugosa variety, which has outstanding hardiness. 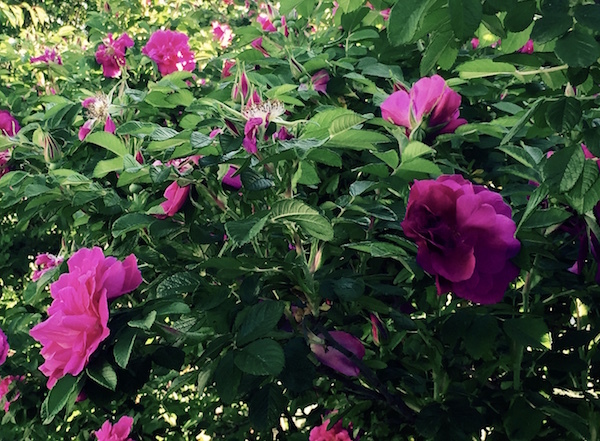 Rugosa roses tolerate wind, salt and sand, which makes it ideal for Long Island. They have a tendency to spread, so give them plenty of room. One of my favorite cultivars, ‘Hansa,’ sports fragrant magenta blooms and makes an attractive hedge or specimen. Another good performer in the garden is ‘Ebb Tide,” a deliciously scented floribunda variety with purple flowers borne in large clusters. If you are looking for a rose with unique characteristics, consider ‘Mutabilis,’ also known as the butterfly rose. It is a single-petaled variety with striking mahogany-colored canes and silky blooms that change from pale yellow to apricot to crimson. Proper research is key to finding a rose variety that works for you. Still not sure which rose to grow? 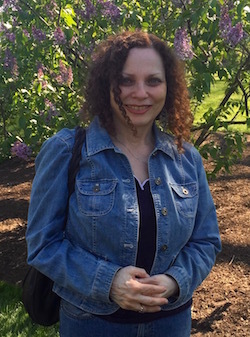 Check out the Long Island Rose Society’s annual show on Sunday, June 10, at 1 pm at Planting Fields arboretum in Oyster Bay. Hundreds of different varieties will be on display and ARS consulting rosarians will be available to answer questions. Bottom line: You don’t have to be a rosarian to grow these beautiful plants. With a little knowledge, you, too, can ensure everything’s coming up roses in your garden.